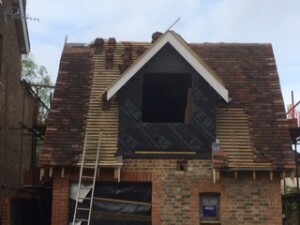 The installation of a clay tiled roof is far more complicated that it looks and requires the expertise of a specialist contractor. The tiles are often different sizes and will need to be sorted through and the different sizes established. Great care is also required for the finer detailing around dormers and valley gutters. The contractor in charge of this project in Reigate has neatly stacked the tiles on the roof ready for fitting, making the job a lot easier. We noticed this whilst carrying out a HomeBuyer Survey for a Client nearby in Reigate.